Being arrested is never a walk in the park no matter what led to this unfortunate situation. Here in Virginia, one common charge that leads to arrests across the state is a DUI charge. 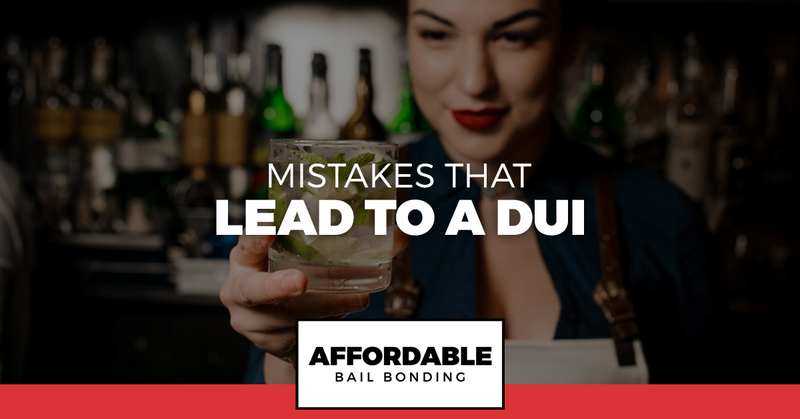 DUI — or driving under the influence — is usually a charge that occurs due to the consumption of alcohol. In Danville and throughout our state, driving with a blood alcohol content (BAC) level of over 0.0 percent will lead to a DUI charge. Here at Affordable Bail Bonding, we are here to assist those who need the help of a bail bond company in Danville after being arrested. No matter what led to your arrest, we are here to provide you with fast and affordable bail bond options. You can count on us for non-judgmental assistance and the experience needed to handle the bail process efficiently. Check out these common mistakes that can lead to a DUI arrest. In some cases, you get behind the wheel of your car and assume that because you only had three or four drinks you are fine. The problem is that measuring your alcohol level by drink number doesn’t really work well. You might be able to drink four light beers over the course of an evening and have a low enough blood alcohol content level to drive. However, when you are drinking craft beers with high alcohol by volume (ABV) percentages, you might not be able to have the same number of drinks and remain sober enough to legally operate a moving vehicle. It is important that you never underestimate strong drinks. Don’t just count how many drinks you are consuming in an evening, instead focus on what ABV percentage each drink contains. This will be critical in knowing your limits. The best rule of thumb is to simply not drive after having any alcoholic drinks period. Another common mistake that leads to DUI arrests is the idea that if you feel sober enough to drive, you are sober enough to drive. The reality is that might feel completely fine behind the wheel and still be over the legal BAC level limits. Rather than basing your decision to drive on how you feel, base it on facts. Did you drink? Is there a chance that your BAC level might be near or above 0.08 percent? If so, don’t risk it. No matter how straight you feel, a cop won’t care when they take a breathalyzer and you blow dirty. In some cases leading up to a DUI arrest, the person charged realized they had too much to drink, pulled off on the side of the road, and decided to sleep it off in their car. The problem is that if you are present in the vehicle with your keys, it doesn’t matter if you are in motion or not. A cop can still charge you with a DUI if you are above the BAC level and in your vehicle with the keys anywhere accessible — this doesn’t even have to be in the ignition. Don’t sleep it off in your car. Choose a friend’s couch instead. Maybe you knew that going to your friend’s party would result in throwing back a few drinks. For this reason, you decided to choose a friend to be your designated driver. This person agrees to remain sober for the whole evening and take all of you who are drinking home safely. Then, in the middle of the evening, you look over and see your designated driver taking shots. Now what do you do? In some cases, this leads people to decide that they will just have to drive themselves home after all. The end result is a DUI. It is far better to call a cab, utilize a shared ride service, or even just sleep on your friend’s floor than to get behind the wheel when you didn’t plan on driving. There are numerous situations that lead to DUI arrests every day across the state of Virginia. Here at Affordable Bail Bonding, we understand how easy it is for this to happen. If you need a Danville bail bond company to assist you with posting bail, we are here to help. We can quickly post bail for you or your loved one after an arrest. Contact us right away.